Much of my extended family had gathered at my sister's home in West Hills for the Thanksgiving holiday. My brother-in-law Tom had been up early preparing two turkeys, one for the oven and another for the BBQ outside, both on the large side, over 20lbs. I gave him some token assistance in the kitchen during the process, but I'm about as home in the kitchen as most folks would be atop North Palisade. On the other hand, I had no trouble picking out an interesting hike we could do in a few hours to give us some exercise and sufficient rationalization for overindulging later in the day. Growing up only a few miles away, Castle Peak was the most recognized natural landmark on the west end of the San Fernando Valley. The summit rocks are easy class 3 and as kids we climbed the peak dozens of times. As was typical back in those days, it was a completely unsupervised affair, and along with water we would sometimes carry matches, knifes, and other paraphernalia not strictly necessary for climbing. Although none of my family or friends managed to burn the dry hills to the ground, others managed to do so periodically. West of Castle Peak was all private property, mysterious old ranches owned by old, bitter men who seemed to take as their only real pleasure the hunting of young miscreants from their lands with the aid of pellet guns packed with salt. Or so the rumors went. I never got shot while exploring back there, but recall being chased off by someone driving around in an old WWII jeep. The primary objective of our explorations beyond Castle Peak was the rumored Bat Cave that was said to exist somewhere in the sandstone cliffs on the southwest side. Unlike the salt pellet guns I never saw, we did eventually find Bat Cave. Litter and ample graffiti marked it as a popular party location for the older teens we had not yet become. The awful smells of urine and decay may have been caused by the bats that were said to inhabit it (I never saw any), the pigeons that nested there, or the teens that partied there. We never stayed long for fear of being run off by the landowner and usually slipped back under the formidable fence as quietly as we'd come. 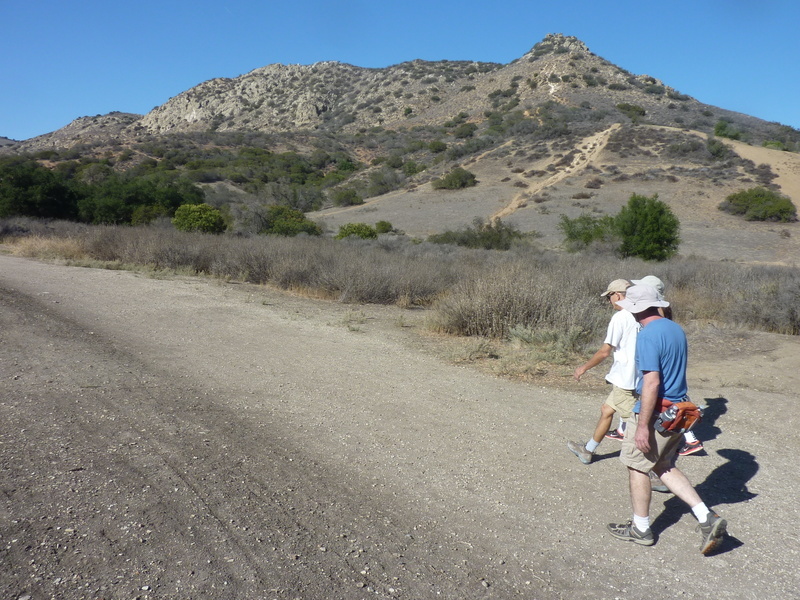 Today the entire area is part of El Escorpion Park, the private parcels bought up by the Santa Monica Conservancy, and one can now hike on publicly accessible lands from Castle Peak to Kanan Road more than five miles to the west. The conservancy lands include Bat Cave which has been renamed Cave of Munits (I have no idea where that name came from) and is now an exceedingly popular place to visit with a trail going right to the base of it, making it easy to find. Most of the graffiti has been remove or painted over, but continuing graffiti is still a recurring problem, but to a lesser extent. The smells have gone too. If bats ever lived here, they no longer could with the constant flood of visitors. There is ample evidence that pigeons still use the pockets high in the caves for nesting purposes. After hiking maybe half a mile, we climbed up into the cave with a dozen others going in and out at the same time. After exploring the darkest alcove with a headlamp I brought with us, we climbed out through an upper exit that takes one to some overlook perches outside the cave. From there we scrambled up over steepening terrain to the highpoint above, unnamed Peak 1,639ft, via a network of use trails. The peak offers a fine view spot overlooking the immense valley and the mountains surrounding it. I pointed to the San Gabriels 20mi to the east, explaining to Jackie that when we were kids there were only one or two days a year that we could see the mountains there, and then only after a good rain. The rest of the time a gray-black smog hung oppressively over the valley throughout my childhood, eventually broken with the advent of unleaded gasoline in the 1980s.